Download game Chaos on Deponia right now! Rufus home planet Deponia is a giant scrapyard and in addition the elysian council just gave the order to demolish it. 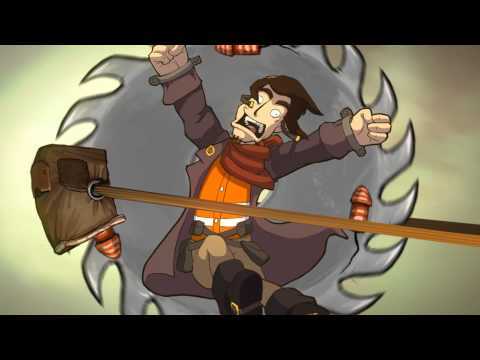 Only the beautiful Goal could save Deponia and stop the explosion. But Goal is stuck with Rufus on the swimming black market which is the biggest rat whole. Furthermore her brain implant – which holds the codes that assure a save journey to Elysium seems to be damaged. At least it’s not just a saying, that you can get everything on the swimming black market. Even a brain surgery. But after mild complications Rufus finds Goal’s mind splitted into three different personalities. Now the chaos is complete. Rufus has to deal with Goal’s three personalities in order to calm her down and to protect her from her angry fiancé Cletus, from the Organon, from the unorganized crime or even a group of rebellions. The most bizarre and yet sweet romance in gaming history takes place right between duckbills, burning saw blades, anti gravity socks and torpedo-dolphins. And therefore Rufus is not just responsible to safe the world and to prevent the evil plans of the Organon, but also to win someone’s heart who is literally three different persons at ones. To make it short: The fate of the whole world depends on Rufus charm and his abilities to handle Goal… Well this might be a blessing in disguise.